© Antony Taubman; Licensee Bentham Open. This paper seeks to set the practical discipline of public interest intellectual property (IP) management in public health into its broader policy context. The most immediate and direct impact of IP systems on public welfare results not from international standards nor from national legislation – though these norms are fundamentally important - but rather from the accumulated impact of numerous practical choices whether or not to seek IP protection; where and where not; and how any exclusive rights are deployed, by whom, and to what end. IP management is the essentially practical exercise of limited exclusive rights over protected subject matter, the judicious use of those rights to leverage outcomes that advance an institution's or a firm's objectives. Exclusive rights are used to construct and define knowledge-based relationships, to leverage access to technology and other necessary resources, and to enhance market-based incentives. IP management choices range across a broad spectrum, spanning public domain strategies, open or exclusive licensing, and strong exclusivity. The idea of ‘exclusive rights’, as a specific legal mechanism, can run counter to expectations of greater openness and accessibility, but actual outcomes will depend very much on how these mechanisms are used in practice. For public interest or public sector institutions concerned with health research and development, particularly the development of new medicines, IP management choices can be just as critical as they are for private firms, although a predominant institutional concentration on advancing direct public interest objectives may lead to significantly different approaches in weighing and exercising practical choices for IP management: even so, a private sector approach should not be conflated with exclusivity as an end in itself, nor need public interest IP management eschew all leverage over IP. This paper offers a tentative framework for a richer typology of those choices, to give a sense of practical options available and the factors that might guide their application, but without advocating any particular approach. Keywords:: Intellectual property, research policy, patents, innovation..
[Asclepius] freed of their misery, each from his ailment, and led them forth- some to the lull of soft spells, others by potions, still others with bandages steeped in medications culled from all quarters, and some he set right through surgery. But even wisdom feels the lure of gain- gold glittered in his hand, and he was hired to retrieve from death a man already forfeit: the son of Kronos [Zeus] hurled and drove the breath, smoking, from both their chests-savior and saved alike speared by the lightning flash . Asclepius … introduced medical treatment for those who have a good constitution and lead a healthy life … and prescribed for them their customary regimen in order not to interfere with their civic duties … But if a man was incapable of living in the established round and order of life, he did not think it worth while to treat him, since such a fellow is of no use either to himself or to the state. Plato, The Republic, 407 c-e.
Pindar recounts how the mythical pioneer of medical practice, Asclepius, was ‘struck off’ in an extreme fashion – by Zeus’s thunderbolt – for placing love of gold above a more selfless rationing of his medical skills. He was condemned for ‘playing god,’ presuming to confront the mysteries of mortality through intemperate, hubristic advances in medical knowledge – a charge with resonances for today’s medical researchers as they probe the essence of human genetic identity. And Plato’s unflinching utilitarian analysis of Asclepius’s clinical case management shows how ancient societies were confronted with tough choices about allocating scarce medical resources. These accounts of the archetypal medical practitioner illuminate a timeless dilemma: should medical resources go to those who can pay for them, to those who are most ‘entitled’ to them in some principled sense, or to those who will be most beneficial for society? These profound ethical questions - about fairness and social utility in the allocation of that most fundamental of medical resources, knowledge - remain unresolved today. The challenge of implementing a universal right to health is that, in practice, it entails the allocation of medical resources that are inherently scarce and necessarily rivalrous (by contrast, enjoying freedom of speech does not deny others that right), and modern medicine is increasingly resource-intensive (by contrast, the technological infrastructure required effectively to exercise freedom of expression is falling in relative cost). Rationing medical resources to fulfil a universal right to health is problematic whether the resources in question essentially concern direct patient care (e.g. skilled medical workers), the environment that sustains health (medical infrastructure, medications, and broader needs such as the availability of safe drinking water), or those applied to researching and developing new medical treatments (research capacity, financial and human capital, research and development infrastructure, and developmental, clinical and regulatory capacity). A further, fundamental - from some perspectives, controlling - factor is that for the most part society has, by default, largely chosen to leave the intermediate and final stages of development of new pharmaceutical products to the private sector; while other models for drug discovery and development are actively explored, there are few examples of new medications that have been developed into finished, effective and clinically-proven products solely through public sector institutions, without the involvement of at least some private sector resources along the development pipeline, so that in practical drug development public interest and public resources are intrinsically mixed with private interests and private resources. Some commentators respond to this status quo by calling for more active and better resourced public sector programs of new product development, for stepped up public funding and control of the full research and development pipeline, and for alternative innovation structures that decouple the economics of drug development from the market for finished products. No view is advanced in this paper on the legitimacy or the relative efficiency and equity of any existing or potential future models, a broader policy debate not touched upon here. But, for the immediate present, one must address the current state of affairs - a complex interplay of public and private interests - in considering how practically to promote universal, equitable access to medications. To the extent that it is the private sector that brings new medications to the dispensary, firms can be expected to allocate their resources so as to promote their commercial interests, given that company management is under a fiduciary duty to do so. And if public sector institutions need to cooperate with firms can engage private sector resources to yield public health outcomes in practice, then these institutions will need to acknowledge and accommodate legitimate commercial motives - the same “lure of gain” . But need these distinct interests be set permanently or intrinsically at odds with one another, in an essentially zero-sum analysis? Or is it analytically and practically more productive to work from the assumption that these two sets of interests (to the extent that they can be coherently clumped together at all) can not only be reconciled, but indeed may be mutually dependent and potentially synergetic in a mixed market economy? It is that goal – the conscious construction of non-zero-sum forms of working with biomedical knowledge that can advance legitimate private interests while focusing on attaining public health interests – that some strategies for public-interest IP management in the field of health work towards. Given this backdrop of scarcity, and rivalry over resources, it is unsurprising that some proponents of a right to health view the IP5 system as being inherently at odds with attaining universal access to appropriate health care, or at least discern deep conceptual tension between the right to health and the rights attached to IP, requiring the active intervention of governments , a conscious process of reconciliation between different normative goals, or the assertion of the primacy of fundamental human rights over the more contingent, utilitarian rights granted under an IP law. The central legal logic of an IP law system is that it sets out rights to exclude third parties – rights to say 'no', or to set conditions, for others' use of certain protected material - in other words, it creates exclusions from the public domain.6 Typically, given the concentration of patent ownership in the commercial sector, the right to exclude others from the material protected by patents is normally exercised so as to promote a firm’s or an individual’s own commercial interests: “the normal practice of exploitation by patent owners, as with owners of any other intellectual property right, is to exclude all forms of competition that could detract significantly from the economic returns anticipated from a patent's grant of market exclusivity” . The law of human rights does recognize a ‘right to protection of the moral and material interests resulting from any scientific, literary or artistic production of which one is the author’ ; this human right is potentially promoted by (but should not be conflated with) the rights flowing from tenure of IP. Authoritative commentary stresses that this human right is itself subject to ‘limitations in the public interest’ , setting this particular right into a utilitarian context. This article explores these policy dilemmas and ‘apparent conflicts’, with a view to elaborating the potential functional role of IP mechanisms,7 particularly the practical exercise of patents, in promoting public policy outcomes in the field of human health, in line with the “right to health” of human right law. This article does not focus on the substantive elements of human rights law, nor on international and national patent laws and standards - patentability, exceptions and limitations, compulsory licensing, etc. - that have recently preoccupied international policymakers and much policy debate. The approach taken is firstly to review the general context of IP policymaking, and then to highlight the impact of specific choices undertaken within the framework of the patent system. This is not to suggest for a moment that this focus is comprehensive or sufficient in itself; this approach merely supplements and may inform a more comprehensive account of the patent system and its implications for the right to health, and certainly does not substitute for such a wide-ranging analysis. This supplementary approach may nonetheless be useful since the ultimate actual impact of the patent system is felt not from the mere presence or absence of a formal system of assessing, granting, and enforcing patents, but from the judicious, skillful application and regulation of these legal mechanisms in practice. Overall positive welfare gains for public health that may flow from the patent system would emerge from an accumulation of individual practical choices to apply for and to deploy specific IP rights, not solely from the relatively abstract process of shaping the legislative framework within which rights are deployed. Equally, tangible harms that are actually felt in practice would result also from particular choices about how individual IP rights are exercised in practice, and not directly from the passage of stronger or weaker patent legislation, nor immediately from the decision to grant or refuse a patent on an application (again, this is not to suggest that these broader factors are not fundamentally important - it is just to recall the significance of accumulated choices concerning the practical exercise of any patent rights once granted). Accordingly, this article considers the practical role of patents when actively, directly implemented with the explicit goal of promoting positive public health outcomes. In short, it considers how the exclusive rights established under IP law are, can be, or should be, deployed to achieve the inclusive goal of universal access to necessary health care. policy lessons that may be derived from the practice of public-interest IP management, that may apply to the broader management and regulation of knowledge in the public interest. Proponents of the patent system typically stress that it provides private actors with a rational incentive to invest in socially valuable research and development. But when it comes to delivering the benefit of innovation, private incentive is often viewed as conflicting with the public’s need for optimal access to new technologies. The logic of IP rights is to exclude: creating a private right to deny or limit to third parties the use of what is protected. This creates a seeming paradox: a policy tool that is meant to promote public welfare in new technologies operates by excluding access to those technologies. Squaring this circle has been a continuing legal and policy challenge from the early days of the patent system: how to stimulate beneficial innovation by private players, while ensuring the public enjoys tangible benefits, or ‘innovation and access’,8 as it is currently expressed.9 Public and private domains of knowledge have evolved over time in a contested, dynamic search for the right balance, not as a static zero-sum tradeoff but through positive sum synergies. Anglo-American patent law draws its roots from a Jacobean text, the 1623 Statute of Monopolies10, which aimed to eliminate harmful monopolies based ‘upon misinformations and untrue pretences of public good.’ From this pro-competition standard (supporting also the right to ply one's trade without undue restraint), legislators consciously carved out an exception for legitimate patents of inventions. This provision, in effect an early patent law, reflected a practical judgement that such exclusive rights could serve public and private interests in conjunction, and that immediate open public access for all inventions would have the effect of impairing the public interest. That paradox again: limited exclusion as a public good. Classically applied to goods and services,14 this analysis may extend to the harnessing of private interest to produce intangible knowledge products of benefit to society. By such an analysis, at least, certain exclusions from the public domain would capture and direct private interest towards the production of public goods that would otherwise not exist: paradoxically, a conscious system of exclusion from the public domain may provide for spontaneous ordering that works for society’s gain:15 provisionally privatizing new knowledge through statutory exclusions may help convert abstract knowledge into tangible public goods. Yet, as soon as this analysis is articulated, it can be suspected as effectively defending exclusive rights as ends in themselves; other participants in the debate find it problematic to invest simple faith in the beneficial operation of private rights as spontaneously advancing the collective public interest, when the policy tool applied is one of exclusion: intuitively, at least, it can go against the grain for a policy aimed at providing for public goods (which are by definition not excludable) to operate through the exercise of exclusive rights. In principle, the tension may be resolved through some key distinctions. First, if the desired public good is available knowledge as such - material in the public domain of knowable information - then the function of the patent system is to deliver technological teaching into that form of public domain; new knowledge must be published and publicly available for a valid patent to be granted. Second, if the ultimate objective is the production of tangible public goods, then the protected innovation is in itself only an intermediate towards that end – knowledge about therapeutic properties of a new compound is not the same thing as the provision of a concrete, safe, effective and stable product in the pharmacopoeia and stocked by dispensaries worldwide. Equally, the ‘right to health’ – the entitlement to receive a certain standard of medical treatment – is not the same thing as the right to make commercial use of a particular form of pharmacological know-how. In practice, as noted, society has often elected to use market-based mechanisms for funding the final practical development of new medications. Leaving aside the broader question of whether this was the optimal choice, it offers empirical evidence that exclusive rights, properly defined and regulated, can serve as at least one means of financing and furnishing socially valuable public goods. Even so, there is a history of concern that policy tools that rely on exclusive rights may be subject to excessive influence by sectoral interests and regulatory capture. Principled resistance has long been asserted against economic privileges and the kind of special pleading that their beneficiaries can use to justify them. Commenting on the mercantilist tendency to grant monopolies in the early industrial age, when patent law was being gradually distilled out of the general law of monopolies as a legitimate exception, Marshall observes that “restrictive regulations, which have an indirect constructive result in promoting national power and dignity, are rightly judged with exceptional favour. But this fine feeling is not without its perils; for it is apt to be turned to account by persons who stand to gain by the restrictions. Such persons are most dangerous when they are honestly convinced, as they often are, that they are striving for the public good as well as their own .” He refers to “sectional jealousies” provoked by monopolies that enabled the suppression of “inconvenient rivals.”16 This tendency to special pleading underscores the need for objective principles to determine the utilitarian benefit of such restrictions, so that they become a genuine mechanism for social benefit and not a bare favour or sectional privilege. Substantive patent law provides a distillation of these public policy principles, and the continuing application of patentability criteria provides one public-interest safeguard against the simple accommodation of private interests. Perhaps this logic might hold together when society relies on private innovation to serve the public interest, if one moves away from a static, zero-sum view of innovation, and accepts that the public expects private investment to develop new technologies as finished products. But does this logic apply when the public pays for research? Shouldn’t fruits of that research enter the public domain, and not be shrouded in exclusivity? Traditionally, management of public research has taken this approach, effectively conflating the public domain and the public good. Yet the growing realization that this choice can - in practice, and in some specific circumstances - work against the public interest yields a fundamental insight into the nature of innovation in a market economy. Of course much research resides properly in the public domain: the human genome is an iconic instance.17 Private interests also choose to defend their interests by pre-emptively placing some research in the public domain through defensive publication, in such cases regarding their continuing freedom to operate as being commercially more valuable than the right to exclude their competitors from using this information. In practice, though, to apply public research insights and to transform them into practically available new technologies requires judicious use of a wider range of tools than reliance on public domain status. Eschewing exclusive rights altogether may mean that public research is available on the library shelf, but that there is no viable pathway for those who need to invest risk and resources into its practical employment and transformation into usable products. When concerns arise over the impact and effectiveness of public funding, it can mean that private foreign interests may benefit more from public-funded innovation, effectively free-riding on research, developing and applying it, and creating new products which are sold back to the originating country. Knowledge management solely through channeling research into the public domain can mean that others decide how the research outcomes are taken up, if at all, and who is to benefit, and that research sponsors lose any say over now these outcomes. At one level, knowledge is the definitive public good – like safe water and clean air. Yet given the practical dilemmas over effective management of public research, an appropriate system of knowledge governance and public innovation policy – systemic IP management to advance public welfare – is in itself a higher order public good; medical knowledge in itself is a public good, but a well ordered mechanism for managing that knowledge to advance actual public well-being may be considered a public good at a different plane of analysis. Public resources are invested in generating the public good of knowledge, but are equally invested in creating a knowledge management infrastructure (legal and administrative) that enables society to extract practical benefit from that knowledge. Hence shrewd, informed and objective use of exclusive IP rights is one element of the mix of policy measures to transform research insights into tangible public benefit. This entails recognizing where the public domain and the public interest diverge, and managing exclusive rights to focus resources on beneficial innovation and the optimal practical application of that innovation. Indeed, actual patterns of innovation for public health – the life cycles of real products - confute a priori assumptions of a fundamental choice between private or public good structures, or between favouring the impetus of exclusive private rights or directly promoting the public interest. The plurality of approaches to ownership and control of patented technology increasingly illustrates the practical distinction between privately-held rights to exclude and private interests as such: a significant proportion of patenting activity in the public health domain is by government agencies, public institutions or other public-interest bodies. Accordingly, the grant and exercise of ‘private rights’18 need not be solely or even marginally directed towards private interest: it is increasingly inaccurate to conflate the private or exclusive nature of IP rights with the narrow pursuit of private interest. IP management that is solely and explicitly directed towards promoting public interest outcomes can include defensive publication and the pre-emptive creation of a public domain (including by waiving IP rights19), but it also includes the judicious deployment of legal exclusions. For instance, the IP-based right to exclude certain uses of protected materials can be used to encourage direct allocation of private resources towards public interest outcomes, in the absence of market incentives: this is the essence of IP management in public-private partnerships. Exclusive rights can be licensed to preclude commercial use of protected materials, to promote non-commercial creative exchange and adaptation.20 The judicious application of the right to exclude can be used to safeguard the open quality of a shared innovative domain for agricultural biotechnology (exercising exclusive IP rights to preclude third parties from excluding open access to derivative technologies).21 Standards bodies use IP licensing structures to ensure open access to standards while encouraging technology developers to pool their technologies for mutual benefit, such as by defining fair, reasonable and non-discriminatory (FRAND) terms and conditions for licenses.22 The claim for protection of traditional knowledge is expressed by some proponents, at least, as a collective right or custodial responsibility to prevent illegitimate use of this knowledge, entailing the exercise of rights to exclude third parties in the name of a public if not the public – i.e. the traditional community which maintains the knowledge according to customary law and practice . Programs of public sector knowledge management that entail obtaining and asserting IP rights can be construed as a form of privatisation of public knowledge, or idealized as a means to maintain collective public-interest control over how public knowledge is developed and applied. Innovation practices and structures developed to deliver public health outcomes typically do not correspond absolutely to one or other of the conventional antinomies of public vs private, or exclusive rights vs open innovation; just as the values driving innovation are more protean than a neat cleavage between open altruism and closed self-interest. Actual development and effective delivery to the public of life sciences products employ a blend of public, private but part publicly-funded, and strictly private inputs, with emphasis varying as to the preferred end of a diverse spectrum of inputs and structures. There is rarely a one-to-one correspondence between one patent, or one licensing model, or one genetic input, on the one hand, and an actual complex product such as a new drug or vaccine, which in its available and functional form will be a convergence of inputs: genetic material, knowhow, foreground inventions, platform technologies and test data. The necessary cluster of diverse technological inputs will be governed, licensed and made available in diverse ways ultimately to yield a practical product that draws together elements of each of these inputs. This makes it almost inevitable that a hybrid mix of forms of knowledge management will be employed along the full, extended pipeline of actual product development. As the above figure (Fig. 1) illustrates, innovation structures make use of a range of options between fully open access and exclusivity, on one axis, and between different levels of engagement with the market on the other axis. The knowledge management task for the product innovator – whether public or private, or both – entails determining what position on this landscape is likely to achieve the practical outcomes desired, recognizing that at least some leverage over technology and some engagement with the market will likely be required. For the public-sector or public-interest knowledge manager, there will be a special responsibility to ensure that engagement with market dynamics and the exercise of exclusive leverage do not become ends in themselves, but remain strictly instrumental towards the overarching goals of the innovation project. Mapping the options for drug innovation structures according to the degree of market engagement to provide incentive to bring the product through the development pipeline and the degree to which exclusivity or leverage is exercised over the core technologies. This Figure is potentially useful only as an illustration of the range of possibilities and practical design issues in shaping a strategy and is not a precise analytical tool; actual choices vary more considerably – for example, some public private partnerships entail complete nonexclusivity. Outline of the innovation financing structure reportedly applied in the development of diagnostic tests by Myriad Genetics, extracted from Rusconi, W. “Health diagnostics: to whom, what and why” . A bare dichotomy between public and private forms of management is likely to be insufficient to describe actual patterns of behavior, or to guide future practical choices. A more comprehensive working typology of these innovation structures and mechanisms may, therefore, be constructed on the basis of different choices along the two axes of public/private resources engaged, and the degree of exclusivity or openness employed. A further factor that may inform such a typology is the manner in which the 'fuel of interest' is ignited – in other words, the incentive mechanism that is used to engage and direct any necessary private resources (including financial, capital and intellectual resources, but also the capacity of the private sector to manage risk and liability). The potential range of incentive mechanisms can be characterized, again, by the extent of reliance on the market as against direct grants or prizes, and the extent to which exclusivity is employed as an incentive. Thus the range of incentive options includes the conventional incentive of potential participation in the market based on defined exclusive rights over a technology or over a regulatory approval dossier, and transferred incentives in which interests based on a certain technology or a defined market are used to promote a guaranteed level of support for a neglected technology or patient group – such as using exclusivity in a wealthy market to subsidize access and distribution in a developing country, or a public sector/philanthropic market; or using a larger market to cross subsidize readiness for another area of need (such as paediatric formulations); or using exclusive rights over adaptive or secondary use technologies (when these are genuine inventions) to enable the development of an existing treatment for other defined needs. The options also include prize funds and direct grants for research, which may aim at creating strong incentives for innovation and investment in risky research, while not requiring the prospect of future exclusive rights to serve as the principal incentive – as it is presented in current debate, delinking the market for innovation from the market for pharmaceuticals. IP management is in principle technology-neutral; the same basic legal tools apply where the technology concerns public health or new construction techniques. However there are several fundamental considerations that set apart the life sciences, and medical technology especially, which may influence the choice of IP management strategy and techniques. These technologies are closely associated with human rights and fundamental human needs concerning health. Medical technology attracts a higher than usual share of public or philanthropic funding, and other public resources (such as research facilities). There are high expectations that the benefits from new technologies will flow directly to the public. pharmaceuticals are developed and exercised within a complex regulatory environment, to ensure safety and efficacy; this can mean that the dynamics, required resources and incentive structures for the development and dissemination of new technologies can differ considerably from other technical fields. create a viable research-based industry sector through the formation of new commercial entities. Each of these objectives represents a slightly different reading of what is the ‘public interest.’ While these objectives are not necessarily mutually exclusive, and indeed may overlap in practice, a strong emphasis on one or the other may well lead to different practical choices in how public sector/public interest IP management is conducted. Accordingly, no one model of IP management is likely to serve the public interest. The choice of IP management model should, therefore, follow policy guidance on what public interest objectives are to be pursued; this is more likely to lead to concrete public benefits than an approach that emphasizes the choice of management structure over the broader definition of objectives. Patent pools: Definitions of patent pools vary greatly, but the essential idea is that participating patent holders agree to license their technologies to one another – some are termed a ‘joint licensing scheme’. Usually the technology is in a well-defined field, or specific patents may be identified. A closed patent pool would restrict access to technology, raising potential concerns about anticompetitive impact if it excludes legitimate competition by those not taking part in the pool. An open patent pool would enable access by any party to the technologies covered, provided they met the standard conditions and undertakings under the pool. Patent commons: Generally broader in scope than patent pools, patent commons allow technology holders to pledge their patented technologies for widespread use for no royalty payment – usually subject to certain general conditions (for instance, agreement not to enforce rights over technologies resulting from access to the commons). Participants may, for instance, legally pledge or covenant not to assert their patent rights against those implementing the technology in certain humanitarian or other public interest domains. License of right: In the patent law of some countries, a ‘license of right’ system provides for a reduction in official fees for patent holders who agree to make their patented technology available to anyone requesting a license, subject to terms that can be negotiated or determined by the authorities. The UK Patent Office, for instance, maintains a database of patented technology that is endorsed as available for a license of right. Non-assertion pledge or covenant: Rather than canceling or abandoning their patents, patent holders may choose to make their technology widely available by legally pledging not to assert their patent rights against anyone using the technology. This may be restricted to specific uses of the technology (such as for specific public health research and development activities), limited to certain geographical locations (such as countries below a certain average level of income), or conditional on the person who uses the technology making available improvements or derivative inventions on similar terms (in the spirit of a ‘commons’). Humanitarian or preferential licensing: This type of licensing technology policy provides highly favorable or free terms to certain beneficiaries, for example, developing country recipients, social marketing programs, or public sector/philanthropic initiatives. Public domain: Placing technologies directly in the public domain is one avenue for their transfer and dissemination. Often, technologies are patented in a relatively small number of countries, effectively placing them in the public domain in all other countries as soon as the patent applications are published. New technologies may be consigned to the public domain, so that anyone is free to use them without legal constraint (unless, of course, health and safety, environmental, ethical or other regulations apply), by the simple act of publishing or otherwise communicating them to the public. Special patent search tools can identify those technologies that have entered the public domain when patents lapse or expire. Open innovation, open source, commons-based peer production and distributed innovation: This cluster of related concepts features in current discussions about innovation models that emphasize a collaborative or shared technological platform for innovation. The term ‘open source’ originated from a software development model that ensures access to the human-readable ‘source code,’ and permits others to use and adapt the software, and to redistribute it, whether or not it is modified. Open source is also now used as a metaphor or description for other fields of innovation in which a technological platform is left open to others to use and adapt, and, on the basis of which, innovations can in turn be shared, for instance, open source biotechnology . ‘Commons-based peer production’ refers to the development of new products through widespread collaborative networks without a formal hierarchy, often brought about by a sense of collective purpose: the Wikipedia online encyclopedia is a good example. ‘Distributed innovation’ refers to the development of innovative products through collective efforts in networks spanning different organizations, institutions or individuals. Publication: what is published, and when, both in order to advance the diffusion of knowledge, and to safeguard freedom to operate by establishing unambiguous public domain status. Partnerships: what relationships are envisaged with what external partners; to the extent that private sector resources are determined to be useful, what positive inducements can be offered to secure those resources, whether these are product development capital, capacity to manage liability and risk, product development know-how and infrastructure, needed background or manufacturing and delivery technologies, or regulatory dossiers; what guarantees are required to ensure that these resources and capacities will be available and effectively delivered; and what fallback options, march-in rights and other guarantees of access will apply in the event that one partner is unwilling or unable to meet expectations. Obtaining IP (typically patents): for what specific inventions are patents to be sought; for what practical purpose; in what jurisdictions; in whose name; and with whose funds. Licensing and sharing IP: in line with overall objectives, what licensing models are to be pursued, and to what end: maximising leverage in order to secure additional resources or background technologies; maintaining leverage over the application of key technologies so as to ensure continuing openness of access; bolstering local research and development, including building up necessary capital investment, infrastructure and product development know-how; focusing on specific interventions in the form of precise research and development outcomes, such as a new vaccine or treatment for a neglected disease. The complex operational interplay between public and private is illustrated in the highly topical instance of the patenting of BRCA1 and BRCA2 genes. These tumour-suppressor genes code for proteins that repair damaged DNA, and regulate the growth of cancerous cells. Mutations in these genes increase the risk of breast and ovarian cancer, so the genes are useful diagnostics for susceptibility to these diseases. Few recent patents have been as controversial as the “Myriad Genetics” patents on these genes . These patents provoked intense criticism and legal opposition in Europe and assertion of public use rights in Canada , due to concern about their impact on the public interest. Critics focused especially on the restrictive licensing policy employed by Myriad, which reportedly entailed actively restricting academic research using the patented gene , and was labeled ‘abusive,’ “immoral” and “unethical” in some critical accounts.23 A broad coalition of public health, research and civil society actors opposed European patents.24 The rationale for the opposition against the patent went well beyond the strict patentability of the claimed subject matter, and addressed the underlying concern related to the negative social impact that the patent was felt to have: in particular, it constrained the use of a genetic diagnostic for susceptibility to ovarian or breast cancer. The European Patent Office (EPO), when issuing a press release concerning this opposition, felt constrained to point out that it “has not been vested with the task of taking into account the economic effects of the grant of patents in specific areas .” This statement, and the wide-ranging controversy it responds to, together underscore the difficult task of distinguishing between pre-grant regulation of the public interest through the accurate application of patentability criteria, and post-grant regulation of the exercise and public-interest impact of otherwise technically-valid patents. In effect, the opposition to the patents operated at three levels: blanket opposition to the very idea of gene patenting, as a fundamental policy concern; challenging the validity of these patents under existing patent law; and concern about how the patented technologies were licensed, which was felt to impose unreasonable costs on public health providers and to limit necessary cancer research. Uniting these three layers was a background concern about the impact on effective and equitable universal access to this important diagnostic tool. In considering the impact of the IP system on public health, and its potentially positive role in fulfilling a right to health, it is therefore necessary to clarify the distinct impacts on these three levels. More recently, in the United States, two patents on BRCA genes held by Myriad Genetics have been challenged by the American Civil Liberties Union among others on the basis that the patents are unconstitutional and invalid . The complaint filed addressed the inherent patentability of nucleotide sequences isolated from the human genome, but also cited concerns about specific consequences 'because Myriad chooses not to license the patents broadly.' This paper advances no position on the merits or the basis of these claims; the case is cited only to demonstrate that there is in such cases a clear connection between claims about the welfare impact of patents as such, and the choices made in the deployment of those patents – the IP management choices. For its part, representatives of Myriad  have pointed out that this innovation model (see Fig. 2)  enables: (i) investment to develop the discovery for the public benefit; (ii) funding and resources for further research (royalties, licensing fees, taxes, etc. ; (iii) investment in improvements to further enhance the quality of the test and genetic services; (iv) investment in provider education to expand service and access ; and (v) better healthcare. Thus, the “Myriad” case – from a critical perspective, viewed as an example of private-sector interests trumping sound public health policy – can also be seen as epitomizing the contrast between two conflicting perspectives on the management of public-sector assets and of the optimal financing of public goods in the public health domain. The “privatized” approach actually makes use of a patent held by a national government and a state university, which is licensed to a private company, formed as a spin-off from the University as a market-based means of promoting technology transfer to the public; the open, public-licensing approach is undertaken by a private company (wholly-owned by an independent charity) which owns and licences the relevant patent in conjunction with a private university. Myriad was reportedly in 2006 yet to turn a profit, largely because of its high expenditures on research and development, its accumulated losses by the end of 2005 amounting to some $180mn , recalling that its very existence stems in part from a perceived past failure to garner the resources for outcome-oriented product development through exclusively public means. distinct incentive mechanisms such as prize funds, including models that would altogether dispense with or limit the application of IP rights. While these forms of intervention differ considerably in their legal status and practical operation, they all represent attempts to address the question of how to deploy statutory exclusive rights so as to promote the public interest. Some are specific to the public health sector; others concentrate on that sector in practice because of the high level of public funding devoted to public health research, in contrast to most other areas of technology. Behind the policy choices in these mechanisms is the need to take account of the actual innovation structures that are emerging in the medical domain. The discovery and development of new drugs and vaccines typically require diverse resources and inputs both from public sources and from private industry. The extent and nature of these inputs naturally differ widely in distinct innovation processes, and the comparative value of private as against public inputs in health innovation is debated in general. Allocation of resources is now a critical issue for diseases and health needs which have been neglected by market-driven development processes. Policymakers who seek optimal structures and interventions to overcome neglect and deficiencies in available public health technologies are therefore probing the interface between public and private inputs in medical research and development. For governmental, international and philanthropic funding agencies and other public health initiatives, finding the right interface between public and private inputs is an immediate practical need. This interface is inherently complex, but is defined in part by a range of IP laws, standards and management strategies. The IP system is conventionally viewed as a legally-determined ‘balance’ between public and private interests, framed in legislation and shaped by international standards. Debate revolves around whether, and how, IP law should be interpreted through, or subordinated to, public policy objectives and other international law principles, notably the right to health. Yet this balance is dynamic, and its overall beneficial impact is achieved through the concretion over time of many distinct acts in the practical exercise of rights, interests and legal safeguards. The formal legal framework defines a policy and legal space, but gives limited practical guidance on optimal choices and public health strategies within that space. Accordingly, public-interest IP management is emerging as a priority in bridging the 10/90-health research gap – the finding of the Commission on Health Research for Development that less than 10% of global health research resources are applied to the health burdens is of developing countries, which amount to more than 90% of the world’s health problems . Different approaches to ownership and access of IP, guarantee of public interest, and market and non-market incentives, including transjurisdictional trade-offs, can leverage otherwise unobtainable public health benefits; but simply to invoke ‘IP’ as an innovation model or to foreswear it as an innovation model does not in itself provide practical guidance to public sector knowledge managers seeking to advance public health objectives. From this analysis, ex-ante IP management strategies need to assess public sector needs before and during the interface with the private sector. This entails making systematic choices about managing IP interests during the initial funding and R&D phases, so that public sector players can structure and define their interaction with the private sector to promote public health benefits. This approach contrasts with discussions centering on ex-post interventions, when IP typically serves as a symbol for asymmetries of ownership and access, and the public interest is characterized by negotiations over pricing, or the threat or implementation of compulsory licensing and government use mechanisms; these are essentially public-interest remedies, rather than strategic management of collective knowledge goods. A comprehensive, strategic approach would address the undermanagement of public IP interests integrally during the research and development process. Combined with limited awareness of practical enabling strategies within the IP policy and legal space, an exclusive focus on ex-post intervention can constrict public health outcomes. Ideally, ex-ante IP management would positively to construct pathways for equitable outcomes and enhanced access for the poor to finished medical products, while promoting dynamic innovation, empowering low and middle income countries to secure indigenous public health solutions, and to meet the Millennium Development Goals relating to public health and partnership for development . health infrastructure, distribution chain and cost issues which can determine how many patients gain access to new medicines and how effectively they are delivered and administered within the context of overall health care. Analysis of the problem of neglected diseases has highlighted impediments or shortcomings at each of these stages, but emphasis has been laid on the need to improve the drug development pipeline, since there is evidence of promising new compounds remaining undeveloped due to the lack of incentives to take such compounds through the development process.30 Policy settings are also seen as an obstacle to translating medical knowledge into actual tangible benefits, where the basic science is well known and current technology offers solutions in principle.31 There are diverse possible structures for filling this drug development gap, which draw on a range of inputs and are adapted to the practical needs in each case. Both public and private inputs have in practice been vital in achieving public health outcomes: one estimate indicates that of the more than US$70 bn invested in global health R&D in 1998, 50% of the funds came from public sources, and 50% from private sources (84% of which was provided by the pharmaceutical industry, the remainder from private not-for profit funding) . The private sector role has been important when research moves beyond basic science to the clinical trials and other development steps required to prove the efficacy and safety of new products and to bring them to fruition as readily available treatments. The scientific and technical skills that are the traditional strengths of the research community need to be supplemented by cross-disciplinary expertise in product development, regulatory processes, production and distribution.32 Both sets of skills are vital for the pharmaceutical development process, whether it is public-funded or based in the private-sector. Hence even publicly-funded research programs have entailed some form of engagement of private sector entities at some stage as the initial research breakthrough is taken from the laboratory to the dispensary, to be available to the public as a proven, tested, stable, mass produced and efficacious pharmaceutical. In this process, public and private inputs may be required, both to marshal the necessary resources and development skills, and to secure access to associated technologies and know how. So the immediate and pressing concerns about major public health problems tap into the broader, long-running public policy debate: how best to promote innovative research and development in the private sector, and to focus it on areas of need, while still ensuring effective public availability of new technologies for the overall welfare of society? How to encourage private activity that promotes the broader public interest? It is perhaps inevitable, then, that the debate turns to some extent on the role and effect of patents in the health domain. Patents are intended to promote innovative private sector activity (research and investment in development of new technologies) for the overall public good, but how to optimize the public interest, especially public health outcomes, within the patent framework remains a contested issue. product development public/private partnerships (PDPPPs) focused on the development of new drugs, vaccines, and other products for diseases that disproportionately affect developing countries. PDPPPs are nonprofit entities that sponsor others to perform or directly perform themselves at least one of the following R&D activities: basic research (such as target identification, validation and proof of concept), animal, preclinical and clinical testing, licensing, and manufacturing. The successful PDPPP may also be responsible for distribution. PDPPPs are distinguished from Access PPPs, which are nonprofit entities concerned primarily with expanding access by pulling together manufacturers, funding agencies (such as GAVI, USAID) and developing countries to enable the purchase and distribution of existing drugs, vaccines, and other medical products . undertakings on specific steps to make new product available, backed by guarantees on access to necessary IP for third parties - e.g. to test data, background technology, manufacturing know-how – in the event that the private sector partner fails to meet the agreed public interest criteria for dissemination of the new product. What is striking about the approach taken in managing IP by these PPP initiatives is the fundamental pragmatism that is applied. IP is seen simply as an implement or practical mechanism to achieve the public-interests of the initiative. For example, the Drugs for Neglected Diseases Initiative (DNDi)  was consciously created as a non-market alternative to drug development, amidst a climate of concern and criticism directed at conventional pathways, and their limitations, due in part to the impact of the patent system . It has adopted an IP policy that foresees a distinct, if limited, role for IP management to achieve its objectives; for instance, the policy recognizes that ‘it is possible that promoting DNDi’s mission and goals will sometimes require outputs to be protected by IP” even if, “ [g]iven the costs involved, patenting is likely to be the exception rather than the rule” and “non-patent types of IP such as confidential information … and copyrights will also need to be considered .” In particular, it may be necessary “ to deal with IP to conclude contracts and undertake research with its research partners, contractors, collaborators and founders; obtain rights to work on and develop molecules, including facilitating DNDi’s or its partners’ access to proprietary research materials; and ensure equitable access to, and affordability of, the end products of its research for patients .” It then elaborates how IP management will be undertaken to retain full freedom to operate, including using assignment of IP to DNDi, exclusive licences and licences of right. DNDi would “negotiate terms with partners to ensure that they will not use the acquired and/or held IP in a manner that impedes equitable and affordable access to the products of the research, or that impedes additional or follow-on research by DNDi, its partners and other researchers, especially those undertaking research on neglected diseases .” It would ensure “the availability and affordability of neglected disease therapeutics” by transferring or out-licensing technologies “to facilitate manufacturing and distribution of its products .” This pragmatic approach does not mean that the management of IP occurs in a policy vacuum: “in addition to a pragmatic day to day approach on IP the DNDi is committed to contribute to the thinking and development of IP approaches in health R&D that are aimed at serving the public good .” Indeed, the lessons from practical experience in product development and dissemination are vital inputs to the policymaking process, as a valuable reality check for a policy debate that can veer into abstractions. And, by definition, this pragmatic approach can of course preclude use of the patent system altogether: the first product released by the DNDi initiative , ASAQ, a new fixed-dose combination of artesunate (AS) and amodiaquine (AQ), was released for dispensation throughout sub-Saharan Africa having been developed under DNDi management in partnership with sanofi-aventis. The drug is reportedly to be available at a “no profit-no loss” price to “public organizations of endemic countries, international institutions, NGOs, and programs promoting access to drugs in pharmacies .” DNDi pointed out that the “fact that ASAQ is made so affordable right from the start and is not under patent removes a significant barrier to its availability and should serve as a model for future drug development for neglected diseases.”35 Another IP tool, trademarks, are used to distinguish the distribution of the treatment to public markets, and its distribution at a higher price to private markets (under the mark Coarsucam®), a tiered pricing scheme with the effect of cross subsidizing low cost public distribution from the private market. stipulating that any licensee of its patent technology “uses it in a manner consistent with our mission of providing poorer countries affordable access to health technologies”. “access commitments” providing that any vaccine “will be promptly registered, manufactured in adequate quantities and distributed at reasonable prices in the developing world” subject to differential pricing: a vaccine is available in developed countries at market prices, but “must be made available in the developing world at an affordable price”. How formal legal structures define partnerships and capture the mutual expectations of widely diverse actors are defined, bridging between commercial and public interest actors and value systems, and between differing perspectives of funding and industry partners, so as to reinforce shared objectives. The pragmatic construction of differing roles and the different allocation of resources, rights and responsibilities necessary to achieve defined public health goals. A broader understanding of practical means of resolving the public policy dilemma of balancing private incentive to generate needed public health products against the goal of guaranteed access to those in need. The focus on delivery of concrete outcomes requires careful consideration of the target groups, disease burdens, and drug dissemination strategy that then shape specific IP management choices geared to delivering the required new public health interventions. For instance, IP management may be structured to free up other (richer) markets or other (more profitable) indications for a private sector partner, thus enabling effective cross-subsidization of the development and dissemination of products for poorly resourced or otherwise neglected patients. Effective IP management may further save costs and resources, by enabling burden sharing for clinical trials and the use of test data for regulatory approval. Public interest IP management may entail planning for access to new medicines at two levels – as a pressing policy issue and as an immediate practical need. Policy and practical perspectives can inform the development and greater understanding of hybrid forms of IP management that would give funding agencies, government authorities and philanthropic initiatives bargaining power, leverage over technologies they help develop, freedom to operate in serving their target areas for delivery of new medicines, and the capacity to catalyze new resources and negotiate access to the panoply of technologies needed to deliver affordably a new drug that is safe and effective. Equally, there is a practical imperative to offer rivate sector players enough legal clarity and workable commercial structures that enable commitment of product research, development and manufacturing resources. guarantees on access for certain third parties - e.g. to test data, background technology, capacity building – to enable priority needs to be served. technology transfer and capacity building so that alternative producers can take up the technology when the originator is unable or unwilling to service certain markets. avoiding the costs and liabilities of maintaining an IP portfolio, while negotiating the necessary access and freedom to operate that is required to meet the defined public interest goals. An essentially pragmatic view would also address squarely how to structure the most effective, optimal form of partnering, as a priority over any specific legal formula; in principle, in establishing the legal structure of a partnership form should follow function, even if in practice there is a tendency to rely on existing formulae and precedents. The structure of the partnership should reflect common understanding of shared values and objectives, recognition of and respect for distinct interests and operational constraints, and the establishment of realistic expectations of the two partners. The structuring of respective rights and obligations is likely to be assisted by consciously recognizing the distinct institutional context of private sector and public sector/philanthropic actors, and seeking a dynamic reconciliation on the basis of acceptance that immediate interests, overall goals and cultural values inevitably diverge; and that lack of confidence and mutual understanding can itself impede or prevent the attainment of shared objectives and the most fruitful pooling of resources. Practical experience may also lead to a reassessment of the assumptions and structures that have underpinned a partnership, and may lead to insights about rights, undertakings, flexibilities and clarifications, as well as the overall mix of incentives and inputs, that could make the project more successful than a mechanism conceived in a more abstract environment and articulated in a legalistic manner. obligations on the research/industry partner to undertake research and development, and to make available background IP, know-how and associated data (including technical know-how or skills and resources required for product development, clinical trials and regulatory approval know-how, as well as the data on safety and efficacy produced by clinical trials). Provisions may amount to a positive undertaking - such as an agreement to undertake research or to provide technology - or an obligation to license or transfer IP rights in the event the research/industry partner fails to, or has insufficient interest to, develop and disseminate covered technology in a particular market. or by setting out other conditions defining how access to the covered pharmaceutical should be granted on the basis of market or non-market mechanisms. broader policy settings and regulatory factors. and crafting practical partnership structures that are defensible to public sector stakeholders and coherently combine and channel public resources into delivering actual public health outcomes for the defined neglected health needs. The benefits of continuing technical assistance and a comprehensive approach to technology transfer that extends beyond simple freedom to operate in a strict legal sense and ensures practical support for optimal use of the technology. 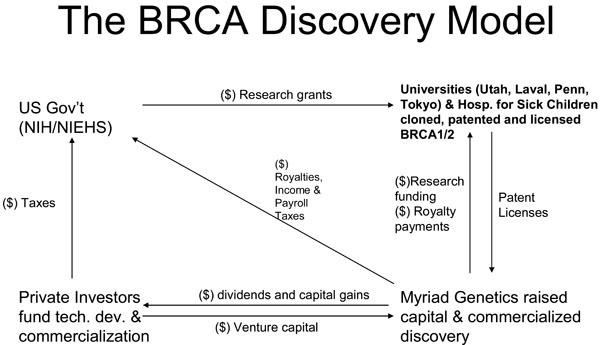 Exclusivity, judiciously employed, can translate into positive control over technologies so as to serve the public interest directly – thus it arises, perhaps counterintuitively, that public health advocates could welcome the grant of a BRCA patent to what is technically a private company (a cancer research charity), while opposing a similar patent held by public entities – because the license granted under the privately-held patent provided a guarantee that access to the covered technology would not be rationed by capacity to pay; meanwhile, the management of publicly-held technologies was criticized for excessive use of the leverage available through exclusive rights to provide the fuel of interest, argued to be to the detriment of the broader public welfare. In short, the public interest, and the practical attainment of a right to health, may flow at least as much from the manner in which IP rights are exercised, across a wide spectrum of practical options, as from the formal scope and contours of the IP system conceived as a body of law and the expression of a balancing of interests by the legislature. The emerging discipline of public interest IP management is assuming critical importance as the level and breadth of public ownership of IP rise steadily, just as steadily as the growth in public concern and public expectation that their concrete interests will be served by the just and effective management of these knowledge resources. It would be facile to suggest that a traditional conception of two distinct public and private spheres in public health innovation is breaking down, if it could ever be coherently identified. It is more accurate to characterize public-private interaction as in a state of rapid evolution towards greater diversity, the scope of interaction broadening to accommodate far greater geographical, cultural, and economic diversity in the use of the patent system. Workable mechanisms for bringing new biomedical innovations to the public may require (1) a range of strategic choices to engage or eschew market mechanisms to various degrees in order to secure the necessary resources and freedom to operate, rather than plumping for a wholly “public” or “private” technology development and dissemination model, and (2) deployment of exclusive rights across a spectrum of greater or lesser degrees of exclusivity and openness, ranging from direct exclusive exploitation or exclusive licensing, through a range of options of decreasing exclusivity, to simple public-domain disclosure. It seems counterintuitive, but some public sector technology-development strategies may require strong degrees of exclusivity, for instance when seeking access to a private sector compound library or when negotiating access to an existing regulatory dossier. Equally, private sector players can see commercial advantage in deploying nonexclusive IP management structures, particularly for precompetitive technologies.37 Public sector programs may avoid patent coverage for research tools such as cell lines, with a view to facilitating wide application while still using contractual control over access to physical materials to secure financial returns to fund further research.38 No single template is likely to be anything but an indicative guide or catalog of options. Ultimately, from a utilitarian perspective, what amounts to good practice in advancing desired public health outcomes is good policy. But what is clear is that the same exclusive right will be viewed very differently if it is held by a private firm, by a public sector agency, or by a private charity, and depending on how it is deployed in practice. The choice to seek or to grant patent protection is not in itself determinative of the public welfare outcomes: much depends on how the exclusive rights are exercised, where, by whom and to what end; and on what institutional policies and on what strategic objectives define and guide IP management choices. § This article was commissioned and written prior to the author’s current appointment. It should not be construed in any way as advancing an official view; in particular, no views expressed in this article should be attributed to the author in an official capacity; to the WTO, its Secretariat or its Members; nor to WIPO, its Secretariat or Member States. Several passages have benefited from valuable discussions with Roya Ghafele and Anja von der Ropp. 1 Article 25 (1) Everyone has the right to a standard of living adequate for the health and well-being of himself and of his family, including food, clothing, housing and medical care and necessary social services … Universal Declaration of Human Rights, adopted by the United Nations General Assembly (A/RES/217, December 10, 1948); also relevant are Articles 27 and 17. The creation of conditions which would assure to all medical service and medical attention in the event of sickness. 3 Clinical mismanagement of tuberculosis, for instance, can promote the development of drug-resistant strains, as epitomized by reports that extensively drug-resistant tuberculosis (XDR-TB) resulted from mismanagement of multidrug-resistant tuberculosis (MDR-TB), see World Health Organization, Drug- and multidrug-resistant tuberculosis (MDR-TB), at http://www.who.int/tb/challenges/mdr/en/index.html, and Global tuberculosis control - epidemiology, strategy, financing, WHO Report 2009, WHO/HTM/TB/2009.411, 2009. 4 See, for instance, the work of the Commission on Intellectual Property Rights, Innovation and Public Health (CIPIH), established by the World Health Assembly in 2003 “…to collect data and proposals from the different actors involved and produce an analysis of intellectual property rights, innovation, and public health, including the question of appropriate funding and incentive mechanisms for the creation of new medicines and other products against diseases that disproportionately affect developing countries…” and the ensuing Intergovernmental Working Group (IGWG) established under Resolution WHA59.24 to draw up a global strategy and plan of action aimed at, inter alia, securing an enhanced and sustainable basis for needs-driven, essential health research and development relevant to diseases that disproportionately affect developing countries. 5 Two distinctions may be helpful in guiding discussion: first, between IP and patents as such; second, between IP and an IP ‘right’ or between a patent and a patent ‘right’. On the first, ‘IP’ can at times serve in discussion as a metonym for patents (or a synecdoche, using the genus to denote the species) in the public health and human rights debate, at times misleadingly so. The most conspicuous instance of this conflation is TRIPS art. , which appears - despite its authoritative articulation of the objectives of IP protection – to be focused, through its references to ‘the promotion of technological innovation,’ ‘the transfer and dissemination of technology’ and ‘producers and users of technological knowledge’ to more on patents (and to a lesser extent undisclosed information and test data, designs and the technological dimension of copyright), than on the full sweep of ‘IP’ (embracing, for instance, geographical indications, trademarks and the aesthetic dimension of artistic works). On the second, the conventional conflation between, say, a patent, and a ‘patent right’ may lead to a loss of information, just as my ownership of a plot of land cannot be conflated with the ensuing rights to exclude others from that land: grant of a patent carries with it certain rights to exclude third parties from certain actions, and critics of the patent system may object to the reification of a patent as a form of property in itself, but there is nonetheless a key operational distinction – crucial to this article – between the fact that I am registered as owning a patent, and the limited rights to object to third parties’ activities that result from my ownership of the patent: once again, TRIPS is an illustrative case study, focused as it is more on the ‘rights’ associated with IP than it is with IP as such (TRIPS is in general silent on questions of ownership and assignment of IP, a point reinforced in the Appellate Body Report, United States – Section 211 Omnibus Appropriations Act of 1998, WT/DS176/AB/R, adopted 1 February 2002, DSR 2002:II, 589). The panel decision in Canada – Patent Protection of Pharmaceutical Products, WT/DS114/R, adopted 7 April 2000, DSR 2000:V, 2289 clarified that there was no ‘hierarchy of patent rights’ within TRIPS: ‘ [i]f the right to exclude sales were all that really mattered, there would be no reason to add other rights to exclude "making" and "using". The fact that such rights were included in [TRIPS], as they are in most national patent laws, is strong evidence that they are considered a meaningful and independent part of the patent owner's rights’ (at p. 156). 6 A broader reading of IP law includes mechanisms that do not create a right to exclude as such, but enable a claim for equitable remuneration, a right to be acknowledged, and a right to object to certain objectionable forms of use (including distorting or derogatory uses, or unfair competition); the general point here is that overall the 'right' granted under an IP system is normally a right to exclude in its essential legal character. 7 The paper concentrates on the patent system as a crude proxy for IP mechanisms more generally, to some extent making the conflation noted above (note 5); a full review would need at the very least to address cognate areas of law, such as test data protection and knowhow/trade secrets, as well as other forms of IP such as the role of trademarks in enabling humanitarian price discrimination. 12 For a brief historical review of these aspects of liberalism, see Steven Horwitz, From Smith to Menger to Hayek: Liberalism in the Spontaneous Order Tradition, The Indep. Rev., 6 (1), Summer 2001), at 81. 14 With the assumption that intangible knowledge products are not economically significant: note Smith’s reference to the intangible or ephemeral product of “players, opera-singers, opera-dancers, etc.” as producing “nothing which could afterwards purchase or procure an equal quantity of labour. Like the declamation of the actor, the harangue of the orator, or the tune of the musician, the work of all of them perishes in the very instant of its production.” Adam Smith, An Inquiry into The Nature and Causes of the Wealth of Nations 119 (Henry Frowde ed., Oxford Univ. Press 1909) (1776). 15 The imposition of an exclusion means that they cease to be true public goods, as these are by definition not excludable, but the disclosure requirements of technology-related IP protection are intended to ensure that protected subject matter passes into the public domain firstly as a public knowledge good (patent information is not, in principle, excludable from the time of its publication), and, through limited term. 17 Then British Prime Minister Tony Blair and then-U.S. President Bill Clinton on March 14, 2000 stated that “ [t]o realize the full promise of this research, raw fundamental data on the human genome, including the human DNA sequence and its variations, should be made freely available to scientists everywhere. Unencumbered access to this information will promote discoveries that will reduce the burden of disease, improve health around the world, and enhance the quality of life for all humankind. Intellectual property protection for gene-based inventions will also play an important role in stimulating the development of important new health care products.” (accessed at: http://clinton4.nara.gov/WH/EOP/OSTP/html/00314.html). 18 Compare the preamble of the WTO TRIPS Agreement (‘Recognizing that intellectual property rights are private rights’) with the growing stock of publicly-held patents – private rights held and exercised nonetheless by public institutions, even government instrumentalities such as ministries of health. 22 Concerning the resolution of conflict between the exclusivity of IP rights and open access to standards in the United Kingdom, “most standards bodies include procedures that take IPRs into account where a standard is in the process of being drawn up. Each participant is expected to declare at an early stage the IPRs it holds which are (or might be) essential to the draft standard if it were to be adopted. The owner is requested to give an undertaking in writing that it is prepared to grant irrevocable licences on royalty-free or fair, reasonable and non-discriminatory (FRAND) terms and conditions under such IPRs, with a waiver of copyright in documentary material. The standards body also makes sure that the patent in question is endorsed as a ‘Licence of Right’ at the Patent Office. This ensures that licences under the patent are available to all applicants as of right and that any disagreement of licensing terms is subject to settlement by the Patent Office,” Matthew Clarke, Standards and Intellectual Property Rights (2004), at 64. 23 e.g. in Keeping Science Open: the Effects of Intellectual Property Policy on the Conduct of Science, Royal Society, 2003, at 10, citing also Wadman, Testing time for gene patent as Europe rebels, Nature 413 (2002), pp. 443. 24 EP 705902 was opposed by the Social Democratic Party of Switzerland, Berne; Greenpeace Germany, Hamburg; the Institut Curie, Paris; Assistance publique - Hôpitaux de Paris, Paris; the Institut Gustave Roussy, Villejuif (F); the Belgian Society of Human Genetics et al., Brussels; Dr Wilhelms, Göhrde (D); the Netherlands, represented by the Ministry of Health, The Hague; and the Austrian Federal Ministry of Social Security, Vienna; and EP 705903 was opposed by the Institut Curie; Assistance publique - Hôpitaux de Paris; the Institut Gustave Roussy; the Vereniging van Stichtingen Klinische Genetica, Leiden (NL); the Netherlands, represented by the Ministry of Health; and Greenpeace Germany. 25 This already can apply within the standards of the Trips Agreement for public non-commercial use of patented inventions: TRIPS Article 44.2 means that patent law may limit the remedies available to compensation only, and may preclude the possibility of an injunction. 26 35 U.S.C. § 200-212. 28 E.g. Austria, 2002 Law concerning Universities. 29 For example, Carlos Morel, ‘Neglected diseases: under-funded research and inadequate health interventions,’ EMBO Reports, Vol. 4, 2003, at p. S35. 30 Numerous promising drug and vaccine leads are sitting on the shelf. It is time for pharmaceutical science to deliver on its tremendous promise for the developing world,’ Dr. Victoria Hale, at www.oneworldhealth.org. 31 This point is made by Alimuddin Zumla, ‘Reflection & Reaction: Drugs for Neglected Diseases,’ The Lancet Infectious Diseases, Vol. 2 (July 2002), p. 393. 32 ‘While supporting basic and drug-lead discovery research, the public sector has rarely developed its own drug development expertise and capacity. It is the pharmaceutical industry that leads product development, from pre-clinical research through regulatory approval,’ ‘Fatal Imbalance, The Crisis in Research and Development for Drugs for Neglected Diseases,’ MSF and DND Working Group, 2001, p.20. 33 These may be formally structured partnerships or other distinct initiatives with a specific objectives to develop and disseminate new medical products; widely discussed examples include Medicines for Malaria Venture (MMV) (http://www.mmv.org), International Partnership for Microbicides (http://www.ipm-microbicides.org). Drugs for Neglected Diseases Initiative (DNDi), Medicines for Malaria Venture (MMV), the Malaria Vaccine Initiative (MVI), the International AIDS Vaccine Initiative (IAVI), the Institute for One World Health (IOWH) and the Global Alliance for TB Drug Development (GATB). Partnerships may also be more ad hoc in character, such as cooperation between industry and the U.S. Walter Reed Army Institute of Research to develop antimalarial medicines. 34 See Antony Taubman, Public-private management of intellectual property for public health outcomes in the developing world: the lessons of access conditions in research and development agreements, Initiative on Public-Private Partnerships for Health (IPPPH), Geneva 2004, at http://www.globalforumhealth.org/filesupld/ippph_cd/04.PDF. 35 Dr. Bernard Pecoul, DNDi Executive Director, . 36 See e.g. international patent applications WO 2007/143606 (HIV-1 Clade A Consensus Sequences, Antigens, And Transgenes); WO 2007/127372, Genetic Adjuvants For Viral Vaccines; WO 2005/047483, Renta: An HIV Immunogen And Uses Thereof; WO 2001/047955, Improvements In Or Relating To Immune Responses To HIV; WO 2001/031046, Invasive Bacterial Vectors For Expressing Alphavirus Replicons (several have since matured into national patents, now in force). 37 The SNP (single-nucleotide polymorphism) consortium and the human genome project are exemplary instances. Frank J. Pindar’s victory odes, Nisetich, translation. USA: Johns Hopkins University Press 1980; p. 171. Lincoln A. Second lecture on discoveries and inventions In: Basler R, Ed. Collected Works of Abraham Lincoln. 1859. Marshall A. Industry and Trade. 3rd. London: Macmillan & Co 1923; p. 457. Taubman AS. Saving the village: conserving jurisprudential diversity in the international protection of traditional knowledge In: Maskus KE, Reichman JH, Eds. International Public Goods and Transfer of Technology under a Globalized Intellectual Property Regime. Cambridge: Cambridge University Press 2005. Taubman A. Several kinds of 'should': the ethics of open source in life sciences innovation In: Overwalle GV, Ed. Gene Patents and Collaborative Licensing Models Patent Pools, Clearinghouses, Open Source Models and Liability Regimes. Cambridge: Cambridge University Press 2009.
 a) European Patent Office (EPO). Breast and ovarian cancer susceptibility gene EP 705902 2001.; b) European Patent Office (EPO). Mutations in the 17q-linked breast and ovarian cancer susceptibility gene EP 705903 2001. Eggerston L. Ontario defies US firm’s genetic patent, continues cancer screening CMAJ 2002; 166(4): 494. Rusconi WE. Health diagnostics: to whom, what and why? Nordic Committee on Bioethics: Business and bioethics Malmö, Sweden 2006. Ganguli P, Prickril B, Khanna R, Eds. Technology Transfer in Biotechnology: A Global Perspective Bayhing for blood or Doling out cash? Economist 2005. Technology Managers for Global Health (TMGH) an educational forum Special Interest Group of the Association of University Technology Managers 2003.
 a)Nishtar S. Public – private ‘partnerships’ in health – a global call to action, Health Research Policy and Systems 2004; 2: 5.; b) Widdus R. Public-private partnerships for health and health care in the developing world Available at: www.ippph.org/index.cfm?page=/ippph/publications&s_criteria=publications&crit&thechoice=show&id=153&typobj=1 2004. Global Forum for Health Research, 10/90 Report on Health Research 2003-2004 http://www.globalforumhealth. org/filesupld/1090_report_03_04/109004foreword.pdf 2004. Gwatkin DR, Guillot M. The burden of disease among the global poor Washington: World Bank 2000. MSF Access to Essential Medicines Campaign and the Drugs for Neglected Diseases Working Group Fatal imbalance: the crisis in research and development for drugs for neglected diseases Switzerland: Médecins Sans Frontières 2001. Monitoring Financial Flows for Health Research Available at: www.globalforumhealth.org 2001. Merz FJ. Intellectual Property and Product Development Public/ Private Partnerships Final Report World Health Organization, Commission on Intellectual Property Rights, Innovation and Public Health 2005. Taubman A. Public-Private Management of Intellectual Property for Public Health Outcomes in the Developing World: The Lessons of Access Conditions in Research and Development Agreements, Initiative on Public-Private Partnerships for Health Geneva 2004.; Cathy Garner. Dealmaking and Intellectual Property Management For Public Interest, teport of a meeting organized by the Initiative on Public-Private Partnershipsfor Health (IPPPH) 2005. MSF Access to Essential Medicines Campaign, Fatal Imbalance: The Crisis in Research and Development for Drugs for Neglected Diseases Switzerland: Médecins Sans Frontières 2001. Boulet P, Garrison C, t’Hoen E. Drug Patents under the Spotlight Available at: http://www.accessmed-msf.org/documents/pate nts_2003.pdf 2003. Kettler H, Towse A. Public Private Partnerships for Research and Vaccines for Diseases of Poverty Office of Health Economics 2002.